Today's guest is Cherry Cobb. Her debut children's novel, Will's War, has just been published by Candy Jar. Will is an ordinary boy who likes to build Lego models, and play with his dog Rollo. But after a stupid row with his mum he ends up at his grandad’s house, where he discovers an old air raid shelter. Will steps inside to investigate, but when he comes out he is not in his grandad’s garden but in Second World War London. How will he get back? Hello Cherry, Welcome to the Scribbling Sea Serpent and congratulations on publication of your debut children's novel, Wills War. It’s lovely to be here, thank you for inviting me and giving me the opportunity to talk about my book. To start, please tell us a bit about your new book. 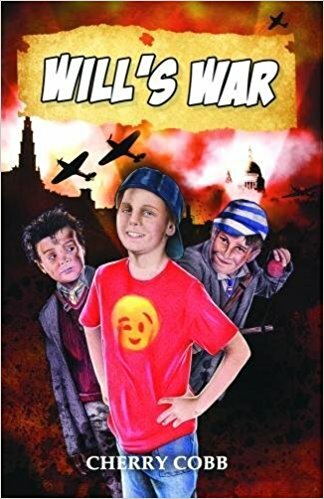 Will is an 11 year old boy who finds an air raid shelter at the bottom of his granddad’s garden, he goes inside to investigate and is transported to WWII London in the middle of an air raid. His mission is to get back home, but before he can he finds himself evacuated to the country. Tell us a bit more about the abandoned village that inspired Will’s story. I have always been interested in WW2 and living close to Dorset I was able to visit Tyneham Village. It is a ghost village abandoned in 1943 during the Second World War. The church and the schoolroom are still standing. It feels like the place time forgot, a great place for imagination and inspiration. I have also been to various museums where you can go into an Anderson shelter. Where families spent many hours together often during the night. You get a feeling of just how hard life was during the war. Both places inspired me to put pen to paper, I just started thinking What if? Being transported back in time must have been quite a shock. Can you give us some examples of the things Will found it hardest to relate to? There was lots of things Will found difficult, from the devastation in the streets to the blackouts and having to take a gas mask everywhere. He also hated the air raids and was amazed to find that people could sleep through them. Will was also astonished by the lack of common appliances in homes such as a toaster or a television. Setting a story during WW2 must have involved a lot of research. What was the most unusual or surprising thing you discovered? I really enjoyed the research and learnt a lot. As a mother myself I was drawn to the information around Operation Pied Piper on the 1st of September 1939 when the Government decided to evacuate civilians from the cities. At London’s main stations a train left for the country every 9 minutes for 9 hours. In total 1 .5 million people were evacuated in 3 days. If I suddenly found myself transported back in time into the middle of an air raid what advice would you give me? Well firstly to take cover as quickly as possible, and wait for the all clear. Secondly, to join in with an activity such as a singsong, to boost morale and keep fear at bay. During the raids people would play cards or other games, or read if the light was good enough. People suffered air raids for many years and had to find ways of combating boredom and anxiety on a daily basis. I bought a copy of the Children’s Writers and Artists yearbook and sent off the first three chapters and a synopsis of Will’s War to various publishers that I thought might be interested in the book. I then waited as you do, for quite some time, just as I was beginning to think I might have to send out a second round I received a reply from Candy Jar Books saying that they liked the concept and would like to see more. That was the beginning of my journey to becoming a published author. I’m still doing the happy dance and in between pinching myself to make sure it’s real. Will we be meeting Will again or do you have something different in the pipeline? I have been working on a new book, but I am drawn to write another adventure for Will. Watch this space! Thank you Cherry for answering my questions and I wish you all the best with Will's War which can be purchased from Amazon UK and from all good bookshops. Cherry Cobb lives in Somerset with her family and two cats. As a former lecturer she appreciates the importance and value of children’s literature. She has won several poetry competitions blaming the success on her wild and vivid imagination. The idea for Will’s War came about one day when she visited a ghost village evacuated in 1943 during WWII. She is never without a notepad and pen and a head full of ideas. Welcome to my blog. I am a UK based author with a passion for the sea. My debut novel Red Rock, a YA Cli-Fi thriller is published Curious Fox. A collection of my short fiction, The Scribbling Sea Serpent, is available now. Here is my idea regarding the weird White Walker spirals we've been seeing for eight seasons now. First copy of “Roger Mantis” arrives! See Catfish and the Bottlemen live at Wembley this Friday (22 Feb) – auction for Tommy. It's been awhile... And DRAGONS! Storyslingers | Website of the SAC Writing Group based in Dorset, UK. All photographs and content on this blog are (c) Kate Kelly unless otherwise stated. If you wish to reproduce any please let me know and link back to this blog.